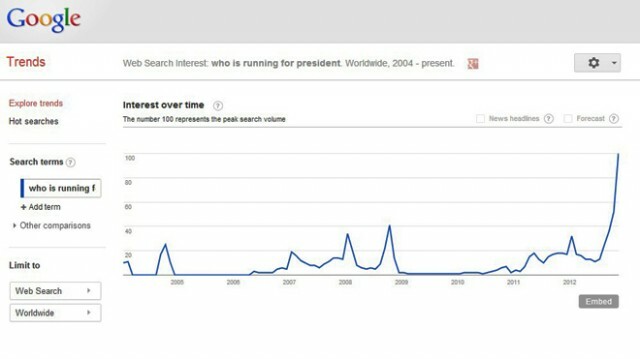 Searches For ‘Who Is Running For President?’ Skyrocket. Wow. Americans are notorious low-information voters: 41 percent can’t name the vice president, and two-thirds can’t name a single Supreme Court justice. As proof that Americans aren’t getting any smarter about politics, Google searches for “Who is running for president?” have skyrocketed. Before readers get too depressed, there are some credible studies in political science demonstrating that low-information voters may not harm representative democracies. University of Michigan Professor Arthur Lupia famously found that, on average, low-information citizens vote in similar ways to knowledgeable voters [PDF]. Ignorant voters can look to cues, such as political party or a trusted official, to effectively emulate the behavior of their better-informed counterparts. Still, research in “Deliberative Polling,” where citizens are educated by experts on issues, finds that information can make a notable difference in public opinion. After hearing expert arguments on both sides about the Iraq War, for instance, more participants in the deliberative poll agreed that the Iraq War was not worth the cost (38 percent in the deliberation group thought Iraq was not worth it compared to 45 percent of those in a control group who did not receive expert education). So, this raises the question: Why has our education system not stepped up and solved this problem?